Every May, a group of friends spend the entire month playing a game of extreme tag, an event that has lasted for the past 30 years. This year, Jerry (Jeremy Renner) has decided he will retire from the game with a perfect record of never being tagged. His friends are determined to keep that from happening by using Jerry’s wedding as the perfect chance to finally tag him. I honestly didn’t know this was based on a true story going in, but I thought all along that this was a great idea. The point of the game is that this way, they stay ‘young’ and remain friends from childhood all the way to their middle-aged years. It’s such a nice sentiment that the concept alone had me interested. Once I watched it and got the full story, oh wow. I really, really liked the story for this movie. For a comedy that’s mainly slapstick, there’s some good performances in this movie. Ed Helms is surprisingly fantastic here. I’ve never really liked him that much but finally in this movie, he’s really fun. Also, when is Isla Fisher not hilarious? I love her so much. She’s so funny and she’s extra hilarious here. Also, I’ve never actually seen Annabelle Wallis in a comedy, and though she wasn’t really FUNNY here, I still enjoyed her character and the way she played her. Though there are some lines that don’t really land amazingly, but I really do enjoy the way this one is written. A lot of the story is told in spurts of action, which is enjoyable. Speaking of Spurts of Action, I love how this is told very “Sherlock Holmes” style with the predictions of what’s going on in voice-over. I think it’s freaking hilarious to use that in a comedy manner. The slow-motion and voice-over combination works so effectively in this film and it never stops being funny. This movie is visually nothing special until you pay attention to just all the details in every scene. There’s so much information told with the camera, which sounds very ‘well duh, Chelsea, that’s how it works’ but in comedy, camera work is usually very straight forward, lots of shot-reverse-shot, not a lot of adaptive camera work like is in this one. It’s shot like an action movie, which makes sense because there’s a lot of action in it, it’s a very slapstick movie as well, so it works really well. Listen, if you don’t like comedy, you probably won’t like this movie. But if you are a fan of comedy, such as myself, you will love it! It’s not just funny, and it’s not stupid funny, it’s silly-but-smart funny and has so much heart. It’s clever in its comedy and in tricking your expectations. The story is as heartwarming as it is hilarious. The fact this movie is based on a real story and the end of the movie shows clips of the real life guys and their fun adventures together only seals the deal on that warm, sappy feeling of ‘awwww’ that this movie will give you. 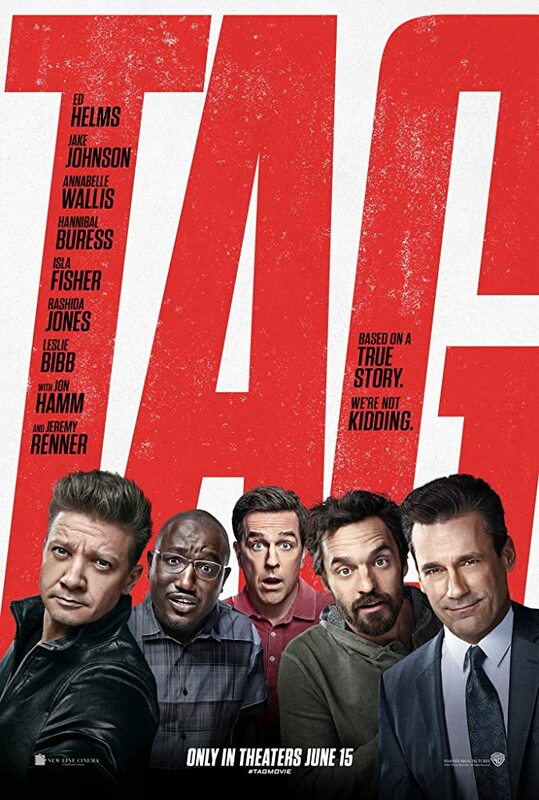 Tag is a movie about adults finding a way to keep their childhood friendships alive in a creative, funny, and very FUN way. What more can you want from a comedy than tons of laughs, silly action moments, and a whole lot of heart? I loved this movie. One of the best comedies I’ve seen in a WHILE. Movie addict, reader, writer, pop culture lover. This entry was posted in Movie Review and tagged 9/10, Ed Helms, Hannibal Buress, Isla Fisher, Jake Johnson, Jeff Tomsic, Jeremy Renner, Jon Hamm, Mark Steilen, Rated R, Rob McKittrick. Bookmark the permalink.